Everybody Has A Price: Why This 'Invincible' Chose Insurance : Shots - Health News Warnings about red tape, long waits and multiple visits to sign up for Medicaid didn't scare Brad Stevens half as much as the alternative — paying $2,500 out of pocket to see a thyroid specialist. When Brad Stevens was young, his only "health insurance" was taking tons of vitamins and spending three hours at the gym every day. But after a serious bike accident and an expensive battle with thyroid cancer, the 59-year-old realized nobody's invincible. When we first met Brad Stevens, he was living in Lakeport, Calif., a struggling massage therapist in a struggling town on the southern tip of Clear Lake. Stevens had been uninsured his entire adult life, and used to believe firmly that clean living and exercise could stave off any need for medical care. But after a bicycle accident that injured his shoulder, and a battle with advanced thyroid cancer, Stevens was anxious last fall to enroll in some form of insurance — any kind of insurance — under the Affordable Care Act. "I talked to an insurance guy who is selling Obamacare, and found out I don't qualify," Stevens said when we first talked to him last November. "What I'm going to get is Medi-Cal — California's Medicaid program." The insurance broker had warned about long wait times. But when Stevens called the toll-free line for Covered California, the state's insurance marketplace, "I waited four minutes," he says. "It was a piece of cake." The operator didn't offer to help him apply for Medi-Cal, but instead told Stevens to call his county's social services office. "It wasn't a one-stop shop," Stevens says. When he finally called the county office on Jan. 6, he was worried he might own too much stuff to qualify — that his two aging cars and the modest home he had bought long ago from his mother would count against him. That's a common concern; some rules about property and Medi-Cal qualification changed under the Affordable Care Act. Sure enough, the forms that arrived in the mail asked for details about his bank account and any cars he owned. "So I called them back up and said, 'You don't need half of this stuff that you're requesting.' They said, 'Yes, you're right. That's an old form. We haven't switched over.' "
On Jan. 23, Stevens collected his records and made the half-hour drive down to the county social services office. "They were really efficient at the office," Stevens says, sounding surprised. He says of the county worker, "She was like, Boom! Boom! Boom! She's been doing this 10 years. I was just signing stuff." The county worker told him to expect the Medi-Cal enrollment process to take 45 days. When we next talked on Feb. 7, Stevens was anxious to get his insurance card. 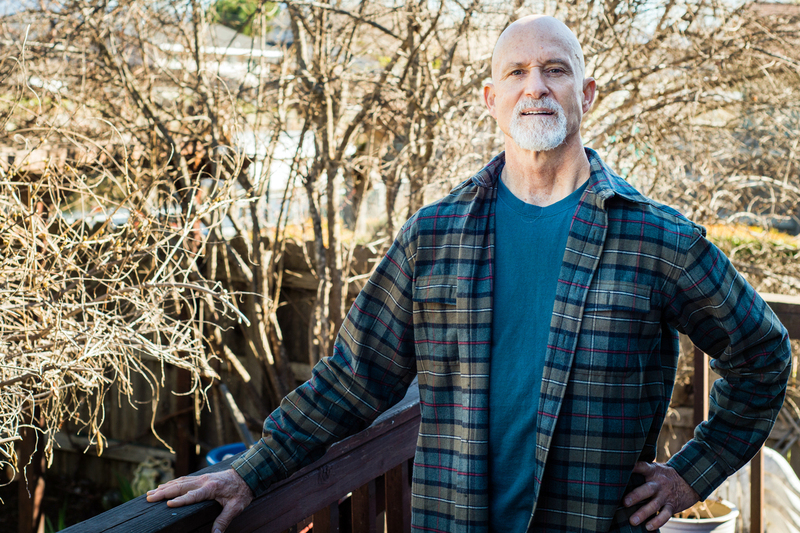 He needed to refill his thyroid medication — he has no thyroid and relies on medication to keep his body functioning. His pharmacist told him the company that makes his pills had raised the price from $12.99 to $68. "I'm down to 24 pills right now, so I'm counting them daily," he told us. "If I haven't gotten my [Medi-Cal] number before I'm out of pills, I'm going to call Wal-Mart to find out what their price is." There were other concerns if his Medi-Cal didn't kick in soon: To monitor his thyroid condition, Stevens has to get his blood drawn every year. In the years following his thyroid cancer, he could get the blood work done for $50 to $60 (he always paid cash), but now that same service was costing him $200. "It's gone astronomical," he told us. Now that I'm covered ... it's an incredible peace of mind. I'm going, 'Yee-haw!' "
With only a few thyroid pills left — and still no Medi-Cal confirmation — Stevens went to Wal-Mart and was able to get his prescription filled for $10 in cash. It's a different brand than he's used to, and he says it makes him more irritable and restless at night. "The medication I get at Wal-Mart isn't as good as the medication I get here at the pharmacy in Lakeport," he says. The brand stocked at his local pharmacy, while now much more expensive, "keeps me really level. ... I find [that with] the stuff from the pharmacy at Wal-Mart, I do more fluctuations — moods and more [nights with] night sweats. More heart palpitations." At the beginning of March, a Lake County case worker called Stevens to tell him his Medi-Cal was active. "Basically it took two months, from start to finish," Stevens says. "Now that I'm covered, I want a physical, and a regular checkup that normal people [who have] insurance get. And I want to get a colonoscopy," Stevens says, laughing at his own enthusiasm for the unpleasant procedure. It's been a few years since Stevens has seen a specialist about his thyroid. The last specialist, at the University of California, San Francisco, charged him $2,500 for an hourlong visit. "It was super expensive," Stevens says. "And I ran out of money." Now that he's enrolled in Medi-Cal, Stevens plans to call his primary care doctor soon to make an appointment and search for a specialist in his rural region. Even though the card still hasn't arrived, he says being accepted into Medi-Cal is an extraordinary relief. "It's an incredible peace of mind," Stevens says. "I'm going, 'Yee-haw!' "
This story is part of a partnership with NPR and Kaiser Health News.